Welcome to The Craft's Meow's FIRST Birthday Celebration! We have lots of new and exciting things the next few days and I hope you can celebrate along with us. I'm so glad you can join us today as The Craft's Meow's team previews two of my sets for March, Beautiful Spring and Mother and Father. Happy Spring is perfect for those who love to color. But even for those who don't, there are solid images in the set. I love to color, but don't always have the time to invest, so the solid images come in handy. Mother and Father is a sentiment set that honors our beloved parents, just in time for the upcoming Mother's Day and Father's Day celebrations. 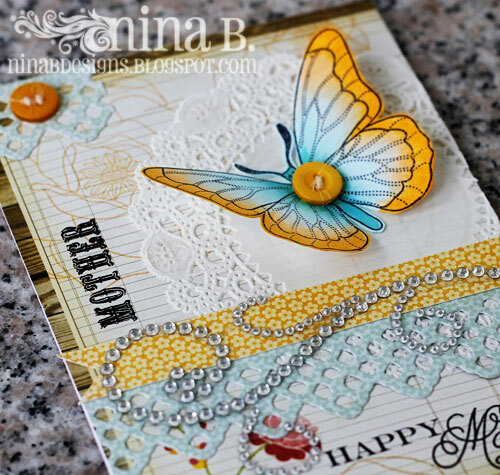 For my first card, I stamped and colored the butterfly from Beautiful Spring with Copic markers in two hues. I did this previously on another butterfly and I received inquiries about how I did that. I'm no Copic expert (haven't had the opportunity to take a class since they don't come to Croatia :), but I will do a tutorial on this on a future post. The sentiments are from Mother and Father. The lovely papers are My Mind's Eye. I stamped the line art flower image on the patterned paper. I die cut that border lace using Spellbinder dies. The gorgeous flourish bling is by Want2Scrap. And here's my interpretation, using both Beautiful Spring and Mother and Father sets.I colored the flower and leaves with Copics. The papers are again My Mind's Eye. Don't you just love that bling? I can't get enough of Want2Scrap products! 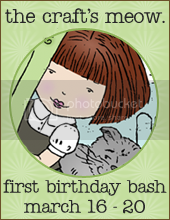 Of course, there will be prizes and other fun stuff going on as we celebrate TCM's birthday. Make sure you check out The Craft's Meow's Blog for more information on giveaways and more info about the challenges! Thanks for your visit! Beautiful cards! 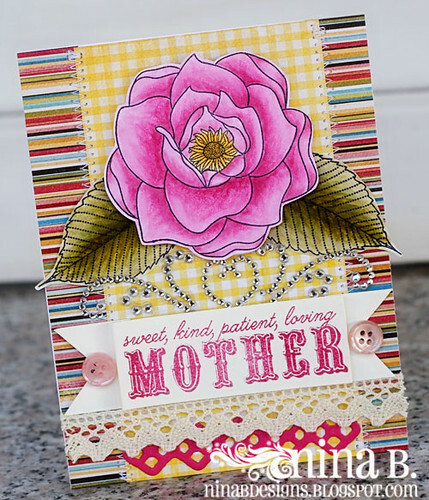 I love the way you use patterned paper, bling, stamps, coloring, and diecuts together and get a fantastic looking project- you have suh a good eye for what works. Gorgeous cards Nina. I LOVE the brilliant butterfly and the flower is stunning. beautiful cards Nina! I am in love with that big butterfly. As always.. your card look so beautiful in anyway. I love those butterfly & flower. Oh Nina, that flower is amazing! Cannot WAIT to see the full set!! That butterfly is beautiful, the coloring is beautiful and I love the added button on it! Thanks so much! beautiful Nina...love your choice of colors! Nina...your stamps are incredible. Your cards are so gorgeous. You are one very talented lady and I love that I get to see your work. What a blessing the internet is! Thanks for sharing your creations. Beautiful cards and stamps! 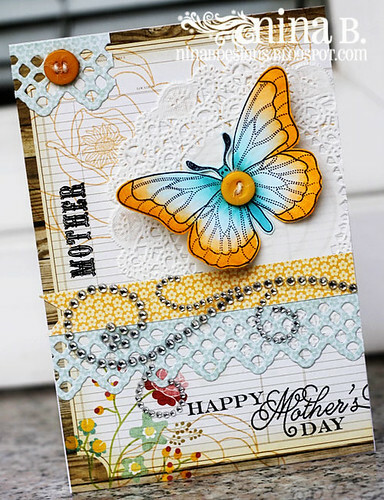 Live the colorin on the images, especially the butterfly and I love the doily on the first card! Gorgeous, Nina! Love these new sets of yours!! Gorgeous cards and love the stamp sets! Gorgeous cards and your stamps are beautiful!!! These are gorgeous! love the beautiful colors you used. So excited for you and the new sets. Gorgeous!!!! Love your colors & coloring! Beautiful cards and coloring of the images. Congratulations on the release of your two new sets Nina. They are both wonderful. Thanks for sharing your lovely cards with us today, as well as your talents. Your beautiful cards have me wanting spring to well and truly arrive! Stunning! These cards are stunning Nina - and your colouring is amazing!! 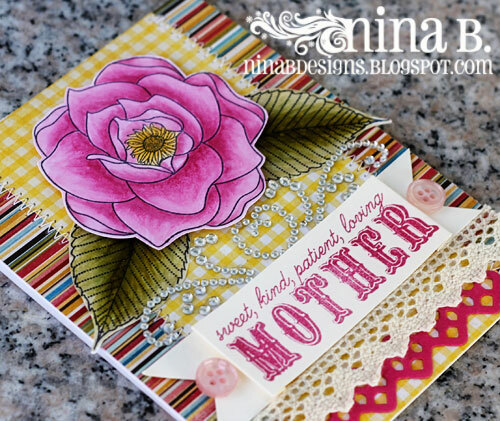 NinaB Designs 1st Blog Hop Winners! Sending Smiles, an Invitation and Winner!